With our special kid-glove antique restoration, Gomillion helps capture that old, well-cared-for look for your important piece. Our experts have an “invisible” touch and can add beauty and strength to your classic furniture. 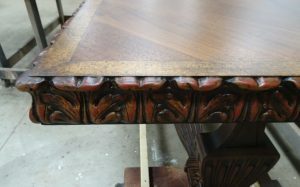 Our structural and surface furniture restoration and refinishing cares for the inside and outside of your items, whether you’re preserving the ageless beauty of an important item or renovating a piece entirely to give it a new life. Gomillion offers repairs of any kind of antique. Our technicians know special techniques needed to restore inlaid wood, gilt, brass, bronze, and leather to restore or repair a beloved family heirloom or a classic antique. We offer countless finishes to put the perfect touch on your item, including high-gloss lacquer, extra-durable Italian finish, smooth satin, bleaching, chalking, white-washing and expert color-matching. With our expertise and tools, Gomillion can transform your furniture completely. We can reshape or resize your furniture to adapt it for new uses and bring it up-to-date for your modern home. We disassemble the item and clean and glue it as needed, hand-stripping and repairing each piece. Then, you choose your new furniture’s look with thousands of stain, paint and finish combinations, revitalizing and customizing your newly personalized piece.